The One-2-One Math program is targeted math instruction in a private, one-on-one setting. This program is completely customized and offers any combination of the following three components: Launch Learning K-8 Math, Homework Help and Test Prep. 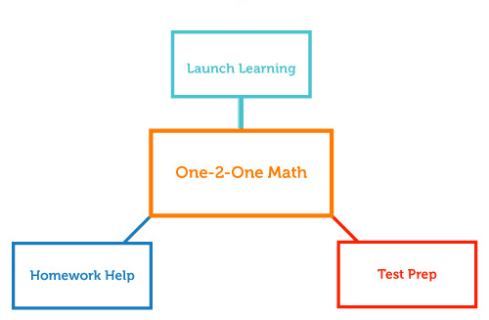 The diagram illustrates how Launch’s One-2-One Math program serves as the focal point for multiple instructional needs. Each student is assigned a talented Launch instructor based on specific needs outlined by the child’s parents or determined by Launch’s in-depth oral and written evaluation. As sessions progress the Launch team collaborates with the child’s parents and teachers to ensure that all goals of the program are met. Sessions are held privately at home or in the Launch center. The One-2-One Math program is sold in packages of 10 one-hour sessions at a price of $115 per session. To learn more about the highly personalized One-2-One Math program including enrollment information, please email info@launchmath.com or call the Launch center at 212-600-1010. Alternatively, you may complete Launch’s One-2-One Private Instruction Survey and a representative will contact you with next steps. The One-2-One STEM program offers Launch’s wide array of STEM classes in a private setting. With topics ranging from Coding With Python to Rocket Science to Architecture & Engineering, the Launch One-2-One STEM program inspires children to explore the world of Science, Technology, Engineering and Mathematics. Students registering for One-2-One STEM have the option to enjoy the program in a pure one-on-one setting with an instructor or enroll with friends in a two-, three-, or four-on-one environment. Each student (or group of students) is assigned a talented Launch instructor based on the curriculum and the goals determined through conversation with parents. In order to maximize the learning and enjoyment for the children, necessary adjustments to the curriculum may be made as sessions progress. Sessions are held privately at home or in the Launch center. The One-2-One STEM program is sold in packages of 10 one-hour sessions. Small group packages start at $50 per session for 4 students. Individual one-on-one instruction is $115 per session. To learn more about the highly personalized One-2-One STEM program including enrollment information, please email info@launchmath.com or call the Launch center at 212-600-1010. Alternatively, you may complete Launch’s One-2-One Private Instruction Survey and a representative will contact you with next steps.